1. Contact Student Services at 937.778.1980 to request an admissions packet OR Click Here to request an enrollment packet online. 2. Schedule a Campus Tour by contacting Student Services at 937.778.1980. • For Health Science Programs/Classes – Call Kelly Luthman, Student Services Secretary at 937.778.1980 or email luthmank@uppervalleycc.org. 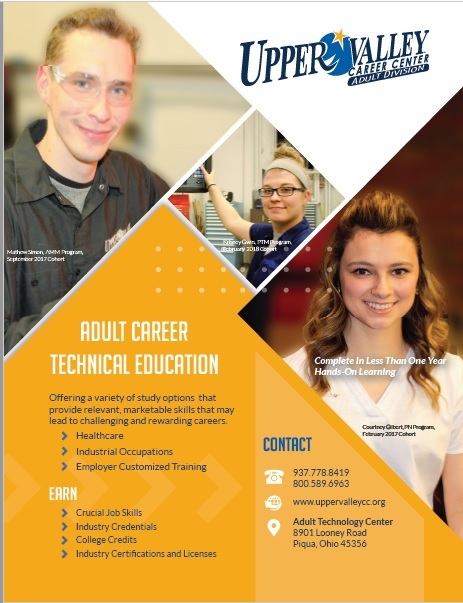 • For Industry and Trades Programs/Classes – Call Jennifer DeMarcus, Student Services Secretary at 937.778.1980 or email demarcusj@uppervalleycc.org. 3. Schedule a time to take the WorkKeys Entrance Assessment Exam. Click Here for a schedule of Workeys test dates. *WorkKey Preparation Classes are available through the ABLE Program. Call Sarah Quick at 937.778.1980 or email quicks@uppervalleycc.org to register. 4. Go to www.fafsa.ed.gov to complete the Free Application for Federal Student Aid (FAFSA). The Career Center’s school code is 014058. 5. Call Student Services at 937.778.1980 to schedule a Financial Aid meeting. NOTE: If you are interested in our Practical Nursing program, there is a separate Practical Nursing Program Admissions process in addition to the Adult Division Admissions process. Call Kelly Luthman, Student Services Secretary at 937.778.1980 or email luthmank@uppervalleycc.org for the Practical Nursing Admissions packet. 1. Contact Student Services at 937.778.1980 to request an admissions packet. • For Health Science Programs/Classes – Call Jeannette Schmelzer, Student Services Secretary at 937.778.1980 or email luthmank@uppervalleycc.org. 3. Complete the Admissions Packet and return all forms to Student Services with your $25.00 Admissions Fee. 4. Submit payment before the first day the class meets. 1. For FREE Aspire Classes contact the Aspire Office at 937.778.1980 or email Sarah Quick, Aspire Director at quicks@uppervalleycc.org to sign up for Program Orientation. 3. When your course starts, return to our Online Instruction Center and click the Classroom link. 4. To begin your studies, simply log in with your e-mail and the password you selected during enrollment.